Birds; a seemingly every day ordinary part of life. We see the obsidian-like crows scrounge for crumbs to survive the cold damp day. We watch in awe as the radiant red cardinal finds fruit from the coarse branches of a sweet smelling fig tree. We stop and listen to the resounding knock of a woodpecker’s vigorous journey to find their next meal. We laugh as we eavesdrop on a mockingbird’s conversation with its beige neighbor. We beam as we gaze upon the tiny humming-bird as she serenades a sweet melody to the Zinnia she sips from. But we don’t notice that these ordinary birds are more than scavengers. God created them all so extraordinarily that none are the same and each have their own special features, crafted homes, and nourishing diets. The stunning toucan has a beak so artistically crafted so they can skin their fruit to expose its sweet mango. The shy robin lays her smooth teal eggs in the shabby nest she made from her natural surroundings. The peacock’s feathers were made so beautifully and brilliantly with vibrant colors that attract his future mate. While the emperor penguin doesn’t fly, his warm fluff-like feathers keep him and his hatchlings warm in the brutal Atlantic winds. The mighty and valiant eagle’s feet are perfect for scooping up their defenseless prey from the harsh landscape below. The owl has giant eyes that can see in the dreary darkness of night when it wakes to play. Birds; with their weightless hollow bones that allow them to fly high, giving man the inspiration and hope to get through the tough times. With their songlike symphony of chirps that serenade our sorrowful spirit when we are low. With their synchronized flock patterns that glide together in perfect patterns of hundreds, to remind us that if we stay together we are capable of amazing things. With their fearless courage to stand strong and protect their nest home and cherished family. With their distinct knowledge to find the same food they had hidden away secretly from the harsh winter. Birds; a seemingly everyday ordinary part of life to some, but to me they were made to soar. They were created to inspire us. They were created distinctly. They were created with an ultimate purpose from God. What is that ultimate purpose? Only the birds know. because of you I am free. God is with us, you will see. and with you I am sure to be. just remember that God is the key. 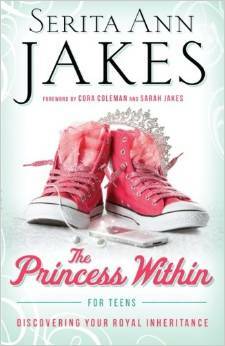 I liked reading The Princess Within by Serita Ann Jakes, the wife of Bishop T.D. Jakes of The Potter’s House in Dallas, Texas. Serita Jakes is a speaker and writer and has 5 grown children herself. These 17 chapters help teens through life problems by using Bible passages, prayers and journaling. Encompassed in the 203 pages there is talk about peer pressure, boys and parents. There is nothing I didn’t’ like about it, from the cute cover to the headline, “It’s time to get ready for the ball,” on the back. She relates well to teens through her past letters to her “secret keeper” (God) and the great advice she gives. She also includes her short stories about Ella, a modern-day Cinderella, she writes about. She includes pleasant varieties in her writing; for example, if you are not a reader but you get inspired through music, there are songs listed that correspond with the lesson. Or if you would rather be taking a personality quiz instead of reading chapter after chapter, she includes plenty of quizzes too. There is also a section including words from young girls that expresses personal experiences and encouraging stories from girls who have had experiences based on the topic described in the book. All together it makes great read with faith, encouragement, and relatable problems that makes every girl realize their true worth through God’s eyes-A princess of the one true king. I received this free book for review as part of a blogger book review program by Bethany House. 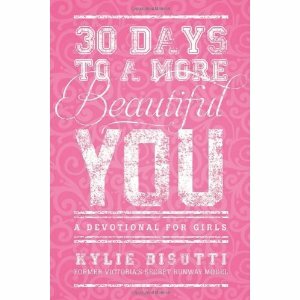 I had a lot of fun reading Kylie Bisutti’s 30 Days to a More Beautiful You. Kylie Bisutti, once a Victoria’s Secret model, shows the truth through her past experiences with beauty. It is easy to travel with this small, soft cover book and it’s perfect for taking it to work or school. It is also convenient to read because it only takes a minute out of any busy day. In her book, she includes important topics such as Finding Your Worth, Your Body as a Temple, Valuing Modesty, becoming the Woman God Wants You to Be, and so many more! My favorite topic is definitely Finding Your Worth which tells us that other people’s negative opinions and views about us don’t matter more than God’s perspective and love for our hearts. She uses “True Beauty Tips” to tell the main focus of that day’s devotional. I especially like her true beauty tip that says, “You are a daughter of a King.” From a teen girl’s perspective I’d say she has a natural talent of showing girls the truth about themselves and them understanding it. Overall, she shows us that God doesn’t look at outward appearances like man does, He only looks at the heart. With scripture, true beauty tips, and questions to ask yourself, it’s a perfect addition for any pre-teen or teen girl’s morning routine. Book Review by A.G. I have been given a copy of this book by Tyndale Publishing Company as part of the blogger program. All opinions expressed are my own.